DuPont has recently released a new survey, showing that urban Chinese consumers has a growing understanding of green products. 70% of these consumers expressed confidence in the environmental claims of green products. The research of “DuPont China Green Living Survey: Consumer Awareness and Adoption of Biobased Products” is based on face-to-face, street intercept interviews conducted during July 21–August 6, 2012, by Environics Research (in collaboration with N-Dynamic Market Research) with 1,000 Chinese consumers in the following nine mainland cities — Beijing, Chengdu, Dalian, Huangshi, Guangzhou, Nanjing, Shanghai, Wuhan and Yinchuan — as well as Hong Kong. The research found that a majority of Chinese consumers are likely to purchase apparel, personal care, hygiene and household products made from biobased ingredients that offer environmental benefits. These green products use ingredients that are composed of biological or renewable agricultural materials, rather than synthetics, and are biodegradable. Since biobased ingredients, such as enzymes, often replace petroleum-based ingredients, they help reduce reliance on non-renewable resources. While just 4 in 10 surveyed said they are very or somewhat familiar with green products, most urban Chinese consumers agree on the factors that make a product “green” and accept that biobased products meet the criteria. The findings also noted that higher-income Chinese consumers were more familiar with and receptive to green products as well as biobased products. 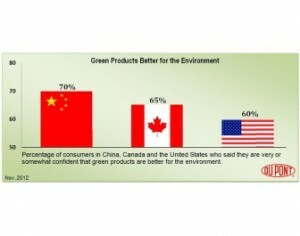 According to DuPont’s research, Chinese consumers express greater confidence that green products are better for the environment than North American consumers surveyed last year. When asked about their confidence that green products are better for the environment, 70% of Chinese consumers surveyed said they were either very or somewhat confident. DuPont estimates the market in China for biobased ingredients used to make a range of commercial and industrial products is growing. Already in North America, there are more than 20,000 products made with biobased ingredients, according to the US Department of Agriculture, which runs the BioPreferred Program to encourage the purchase and use of biobased products.